Guardians of Eternity can be used in schools and at community events to introduce people to a wide variety of themes dealing with the environment and future generations. You can use the film alone or you can accompany the film with the suggested readings below. Here are a few questions to choose from to use with Guardians of Eternity to initiate discussion after a screening of the film..
What part of the film stands out most? Do you think this is just a problem for the people in Yellowknife or should it concern others? What are some general scenarios we should think about when planning for the future in Yellowknife and at Giant Mine. What social or political changes might affect the care and maintenance of Giant Mine? What might change in 50, 100, or 500 years into the future? What do you think are some strategies we can use to communicate the hazards at Giant to future generations? If you were to build a monument to commemorate the Giant Mine site and warn the future, what would it look like? Who should be responsible for the long-term care and maintenance of the Giant Mine site? Do you know of any local places that have been adversely affected by industrial development? Who do you think should see this film and why? 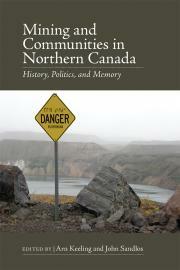 Arn Keeling and John Sandlos, editors, Mining and Communities in Northern Canada: History, Politics and Memory, University of Calgary Press, 2015. Mining and Communities in Northern Canada is a collection of articles examining the historical and contemporary social, economic, and environmental impacts of mining on Aboriginal communities in northern Canada. Combining oral history research with intensive archival study, this work juxtaposes the perspectives of government and industry with the perspectives of local communities. The oral history and ethnographic material provides an extremely significant record of local Aboriginal perspectives on histories of mining and development in their regions. John Sandlos, Arn Keeling and Kevin O’Reilly, “Communicating Danger: A Community Primer on Communicating the Arsenic Hazards at Yellowknife’s Giant Mine to Future Generations.” Open access community based report (2014). John Sandlos and Arn Keeling, “Zombie Mines and the (Over)Burden of History,” The Solutions Journal Vol. 4, Issue 3 (2013) http://thesolutionsjournal.com/node/23361.